GRAND CHUTE, WI - The Wisconsin Timber Rattlers have 35 giveaways on their promo calendar for the 2019 season. These giveaways include eleven bobbleheads and several other memorable collectables for fans of the Midwest League affiliate of the Milwaukee Brewers. All giveaways are available to the first 1,000 fans to enter the stadium unless otherwise noted. The Timber Rattlers have eleven Bobblehead Giveaways on the 2019 schedule. The Opening Night Bobblehead giveaway is an All-Fan Giveaway. Ten-game bobblehead packages are available from the Timber Rattlers Box Office right now. Fans who purchase the bobblehead package guarantee that they will receive a bobblehead for every game - excluding Opening Day. 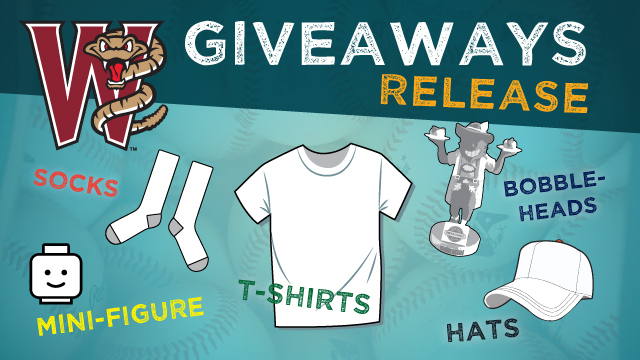 The Wisconsin Timber Rattlers have put together seven games with giveaways as part of a mini-season ticket package. If you purchase one of these Souvenir 7 packages, you will guarantee receiving each of the following items. If you do not purchase a Souvenir Seven package, you will have to be one of the first 1,000 fans (Unless otherwise indicated) to attend the game that night to receive the giveaway! Thursday, August 1: Souvenir Cup presented by AZCO, Inc. Timber Rattlers players will appear on four separate magnets presented by Lamers Bus Lines and you can collect them all. The players to appear on the magnets and the dates these unique collectables are scheduled to be given away will be announced near Opening Day. THURSDAY, APRIL 25 - Retro Baseball Cap: If you are one of the first 500 fans to attend this game, you can take home a Retro Timber Rattlers replica baseball cap. WEDNESDAY, JULY 17 - Cash Envelope: Fox Communities Credit Union will be at the stadium on this night and they will hand out envelopes to everyone as they enter the stadium. Some envelopes will contain different denominations of cash. MONDAY, AUGUST 12 - Bike Helmet: Neuroscience Group will have a limited number of bike helmets for children who attend our annual Kids Rock the Ballpark Day! The Timber Rattlers will begin the 2019 season at Beloit on Thursday, April 4. Wisconsin's home opener is Saturday, April 6 at 4:05pm against the Cedar Rapids Kernels. The schedule for the 2019 Wisconsin Timber Rattlers season is available here. Fans may purchase full season, half season, seven-game to ten-game packages, or group outings for the season through the Timber Rattlers Ticket Office at Neuroscience Group Field at Fox Cities Stadium by calling (800) WI-TIMBER or (920) 733-4152; stopping at the Ticket Office; or online through timberrattlers.com. Individual game tickets for 2019 will go on sale on Saturday, March 16 at 10:00am.